Yet Hong Kong, for reasons I simply cannot fathom, seems to frighten some of the most dauntless frequent flyers I know. Maybe it's the distance--15 hours nonstop from the East or West Coasts, a bit more from Chicago. Maybe it's the fear of lengthy jet lag. Maybe it's the frenetic pace. Or the lack of a riveting, traditional cultural attraction. But as coach fares to Hong Kong have plunged and business class fares occasionally have gone on sale, there seem to be lots more first-time visitors to Hong Kong among the business travel set. So if you're headed to this astounding place for the first time, allow me to present a hit list of must-dos for a virgin visit. 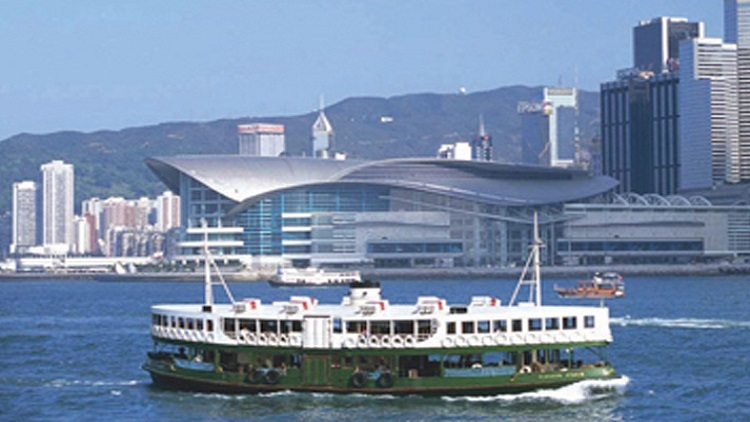 The Star Ferry was once the only way to get between Hong Kong Island and the Kowloon peninsula. There are modern tunnels now, the very efficient MTR trains, even helicopters for the ostentatiously wealthy. Yet the Star Ferry continues to be packed every day because a) it costs just pennies; and b) it is a thrilling way to cross eternally photogenic Victoria Harbour. The ferries run every few minutes from early in the morning until around 11 p.m. Pay using the Octopus Card, Hong Kong's invaluable multi-modal payment system. Go for the upper deck on a ferry, since the lower deck is smelly from diesel and you also get a whiff of Titanic, if you know what I mean. Victoria Harbour is one of the most spectacular vistas in the world, especially at night. But spectacular is never enough in Hong Kong, so now there's a kitschy nightly laser light show with music, too. Even before the light show, the best venue to view the harbor at night was the lobby bar at the InterContinental Hotel. It is packed at 8 p.m. for the lights, so maybe go early or late. (Really, you don't need the laser show.) Of course, the InterContinental offers the Harbour looking at Central and Hong Kong Island from Tsim Sha Tsui. If you want to do it the other way, go the M Bar at the Mandarin Oriental Hotel and you can see Kowloon's skyline at night. Want a free peek? The Avenue of the stars along the Tsim Sha Tsui waterfront has reopened after a multi-year renovation. Ignore the faux Hollywood stuff and concentrate on the harbor view. Imagine that New York's Central Park was actually a steep, green hill that rose 1,800 feet above Manhattan. Victoria Peak, which rises straight up from the towers and streets of Central, actually does. For about a hundred years, it was a green haven for nature walks far away from the clatter and chaos of Hong Kong. Now, of course, it's commercialized with a touristy market and a goofy Peak Tower with tourist restaurants and things. (There is a good viewing platform in the tower, though.) 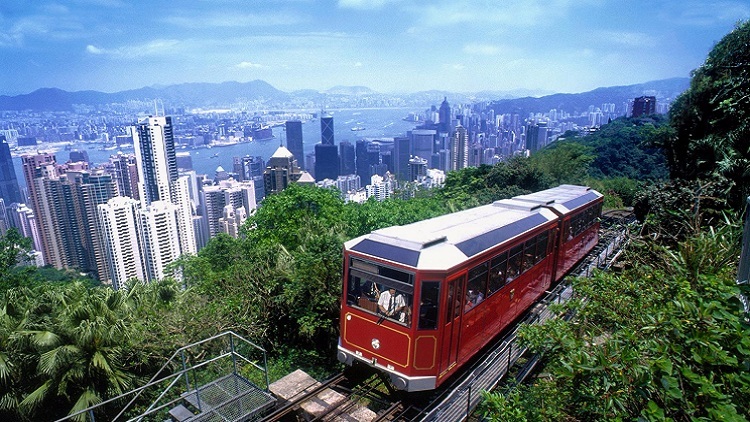 The Peak Tram (left) is worth doing if you don't want to walk your way up. It's been in continuous operation for 130 years. There is also a museum of sorts at the base of the tram. The problem? Long lines. You can bemoan the fact that Hong Kong isn't great on culture--or you can lean into what Hong Kong does best: shopping, eating, strolling and browsing the malls. Start at Langham Place. The highlight is the Atrium and the vertiginous escalators. They were so dangerous that transparent barriers were erected on the sides to stop people from falling. The 15-level mall also has some interesting sculptures, spiral staircases and, of course, shopping and dining as far as the eye can see. When you're finished at Langham Place, walk onto Nathan Road. It is Kowloon's Main street, cultural spine and tourist attraction all rolled into one. Walk south toward the harbor. If you need some green as you head south, there's Kowloon Park. It's cool and quiet(er) with a little bird lake. When you're done, or if you're bored, find the nearest MRT Red Line station (Jordan or Tsim Sha Tsui) and take it to Admiralty. There you'll find Pacific Place, the swankiest of the swank. Besides four hotels and hundreds of shops, there are dozens of dining options and amazing recreations of foreign places. Check out Cova, a replica of the famous coffee bar near La Scala in Milan. Watch the locals swarm any brand you can imagine from around the world. Before there were vertical shopping malls in Hong Kong, there were horizontal street markets offering nearly endless stalls of goods and services. The original Bird Market is gone, replaced, not coincidentally, by Langham Place. Some others still remain, however. The Ladies Market is right near Langham Place. Not far from there is the Temple Street Night Market. It sells a lot of crap, but there are great dining stalls selling local specialties. You'll find roadside herbalists and acupuncturists. It opens around 5 p.m. and runs until 11 p.m. When you smash Brits and Chinese together, what common element is there? Tea. There's naturally a flourishing tea culture in Hong Kong, including tea houses that teach you pairings, preparations and presentations. My suggestion? Grab the MRT Blue Line and take the 30-minute ride to the TaiKoo stop. Use Exit A1 and visit Mingcha, located in a nondescript factory building. Its tea classes are legendary. (Have your hotel concierge make a reservation.) But I would not send you to Taikoo just for tea. Afterwards, walk a few meters to the East Hotel and CityPlaza. It is the upper middle class twin to Pacific Place. (Both were developed by Swire, which also owns Cathay Pacific Airways and the attached East Hotel.) Stroll the mall and watch the locals, maybe have a meal at House of Canton. At cocktail time, head to Sugar, East's rooftop bar. It has sweeping views of the harbor. What you're seeing across the harbor is Kai Tak, Hong Kong's former airport. It's been converted into Hong Kong's cruise port. Tim Ho Wan opened as a humble little dim sum place a decade ago, won a Michelin star and went global. It still has fabulous branches around Hong Kong. The problem? Lines are insanely long. But do take away and sit outside, which is what a lot of locals do. Fook Lam Moon is a fine Cantonese dining room that does extraordinarily good dim sum. It's in Wanchai in Central. This is also an off-the-menu restaurant. Reservations also advised. Some of Hong Kong's highest rollers are regulars here. Above and Beyond is in the Hotel Icon and sits on the 28th floor with great views of the harbor. If you want your dim sum with a view, make your reservations for lunch. This is also one of the best and most creative Cantonese places in town. Luk Yu Teahouse is the classic carts-around-the-room dim sum experience. It is picturesque, cinematic even, with an 85-year pedigree. Sadly, visitors get short shrift, the food isn't what it once was and prices are high. Still, it's an experience. LockCha is a chain of well-regarded tea houses with great desserts and a dizzying tea list. The Admiralty branch is a vegetarian-only dim sum restaurant. It's a logical choice to twin with a visit to the Peak.